We understand making connections at Social Media Marketing World is important to you. In fact, 80% of past attendees have told us networking is a significant reason they attend the event. It’s our goal to help you find your tribe and make deep connections that last well beyond the conference. We’ve developed several different opportunities – both online and at the event – to help you network easily and successfully. Whether you prefer to network at meals, online, or on the go, we’ve got plenty of networking opportunities for you to get the most out of Social Media Marketing World. We have four ways for you to start networking today. Jump into the conversations. #1: Join our discussion groups: This year we have created a number of special Facebook discussion groups so you can connect with fellow attendees. Click here to see the groups available and start connecting today. We have many groups available today and will add a lot more over the next few weeks. #2: Follow the event hashtag #SMMW19 on Twitter and Instagram: Share photos and connect with other attendees. #3: Join the Social Media Marketing World 2019 Facebook Event Page: We provide tips and updates about Social Media Marketing World 2019 here; it’s also a great place to network with other attendees. Go here. #4: Follow the Twitter list of speakers: Follow what our speakers are talking about and start to engage with them now. Click here. The Social Media Marketing World Networking Team is here to serve you both before and during the conference. Pre-event, you’ll see the team on the Facebook Event page and in the groups. 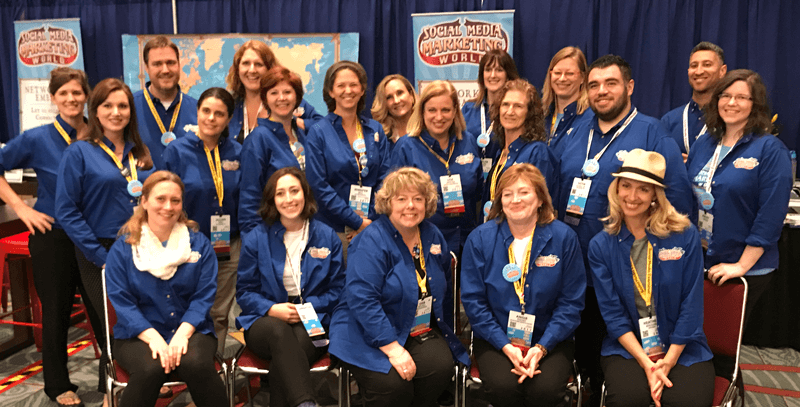 The sole focus of our dedicated Networking Team, “The Blue Shirts,” is to help you make meaningful connections. You’ll find us at Registration on Wednesday and in the Networking Embassy on Thursday and Friday. We are here to help you!